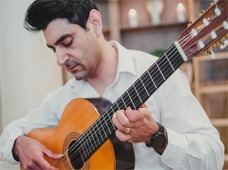 Wedding Guitarist Sydney Mike Rizk performs and specialises in romantic Spanish/Flamenco guitar. 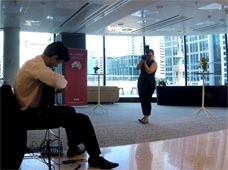 How long does it take Wedding Guitarist Sydney to set up and pack away? 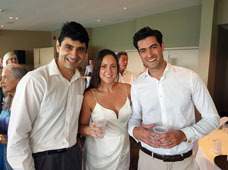 I arrive 30 minutes before the ceremony starts to set up, and it usually takes a similar amount of time to pack away. This 30 minutes is outside of the time you’ve booked. 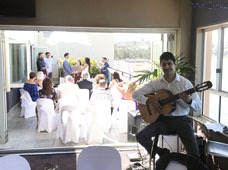 For example, a booking from 4.00pm – 5:30pm means I set up from 3:30pm- 4.00pm. I then pack away from 5:30pm – 6:00pm. I will set up 45-60 minutes before the booking starts and packing away requires less time, usually 30 minutes. This is also outside of your booked time. For example, a booking of 5:00pm – 10:00pm means I set up at 4:00pm, ready to start by 4:55pm, and will pack away at 10:00pm, which means I’ll be away by 10:30pm. 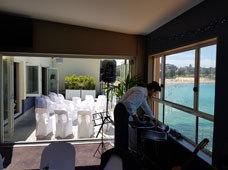 Due to logistics, is it possible for Wedding Guitarist Sydney to set up much earlier than the required time? If you need me to set up more than 60 minutes before the event, I can however it may incur an additional fee. Do I need to organise a sound system? Can I extend the booking time if I need to? Do I need to organise a microphone for speeches? 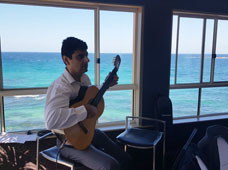 Does Wedding Guitarist Sydney liaise with wedding planners?